Rihanna's Fenty x Puma Spring-Summer 2018 campaign. 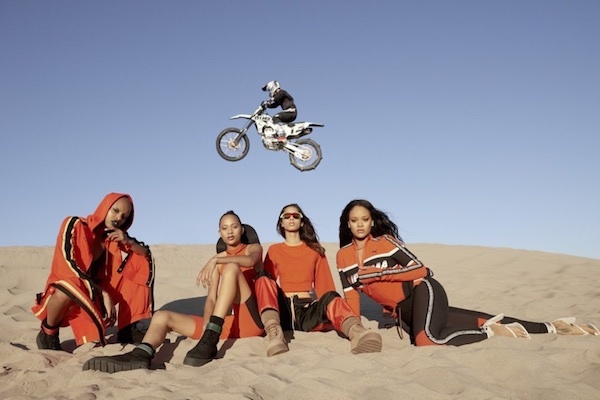 Rihanna continues her Fenty x Puma clothing collaboration with her Spring-Summer 2018 line, marking its second year by Riri taking to the beach with models Slick Woods, Selena Forrest, Theresa Hayes, and Yasmin Wijnaldum. The Fenty x Puma Spring-Summer collection drops on March 15th. MusicRihanna on the cover of Vogue Paris, December-January 2017/2018. BeautyRihanna shines in 'Body Lava' for Fenty Beauty. MusicFirst-look: Fenty Beauty’s 'Galaxy Collection'. MusicWatch: Paul McCartney & Rihanna perform 'FourFiveSeconds’ together at Desert Trip. MusicWatch Rihanna prank Jimmy Kimmel for April Fools Day. MusicRihanna on the cover of Elle magazine, October 2017. MusicWatch Olly Alexander meet Rihanna! MusicRihanna x Manolo Blahnik = 'So Stoned'.